Just like to get some opinions on a good oil return line for the GNs getting a new turbo, the stock appearing one always seems to leak. Spoke with PTE they suggset that which ever one I go with size wise it should be a dash 10. Just looking for some suggestions on some of the after market ones out there. I have TRCustoms drain line, no problems and it looks nice. L little pricey but nice. Been selling these for years. Thanks guys, I had (2) friends try this one both had the same complaint. They could not get the line on, with out putting kinkes in the line. So i am trying to find out what else my be out there. Are you trying to install the drain with the turbo mounted? No reason it should be kinked! The fittings are adjustable, you can't just install them out of the box which is what they probably did. I get them close to where they should be but adjusting them is necessary for a perfect installation. I have one of Marks turbo drain lines yet to be installed. When I eye balled it up.....didn't look like it would fit, so I just used my old drain line. I'd like to install it later in the spring before the car rolls out. 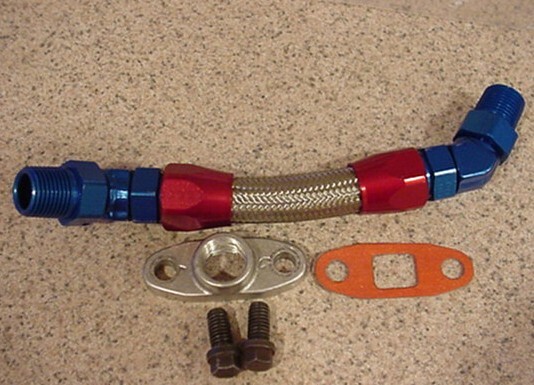 Can anyone who has one of the TR Customs drain line installed post a few pictures so I can get a better idea how it should be installed. I have a gbodyparts oil drain line. Had to trim a little to fit but works great and looks clean. No leaks. what about the fittings...that gbody parts one does not have the proper fitting for the block end. It threads into the adapter in the front of the block. The most important thing about the return line is that it has a steady downward angle toward the front of the engine. The factory line is barely adequate but does have enough downward angle to allow proper drain back. If the line has any point where it's not at a downward angle you are asking for oil leaks into the exhaust and compressor housing under non boost conditions. Ive removed dozens of inadequate drain tubes over the years when they thought the turbo was the problem. Look at the cross sectional area of the stock pipe. It's got quite a bit. The oil is aerated and takes up a lot of space. What do you suggest to remedy this problem. I am going for functionality not on looks. I made my own, bought the plate to bolt on the bottom of the turbo on ebay, it was threaded 1/2-13 npt. Fittings are summit brand cheapies. Fitting into block is also 1/2-13. The 45 degree fitting on the block gave me the best angle. That doesn't look like it's a constant downward slope. I was looking at the very one from Gbodyparts, speaking with a sales person from PTE he suggested any of the after market lines would work, just said it should be at least a(-10) and i am thinking that is the size (dia.) of the line. So I was a little hesistant of Gbody just because of size(dia.). Looking at size (dia.) of the original line and looking at the size of the Gbody one, was not sure how much of a different if any this would make. Also the adapter u spoke on is this something that should be already on the front of the block or something i need to get? As Well as a downward drain that Bison was speaking of, a simple trimming of the line should allow for that. Ease of installaion and function well.